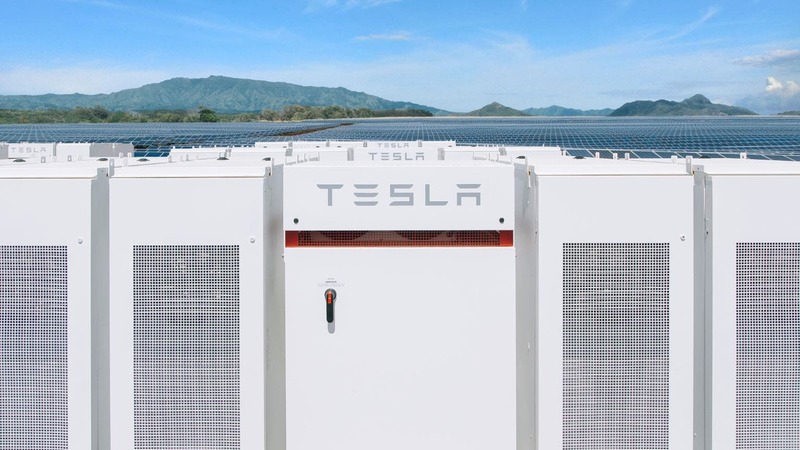 As reported earlier today, Tesla has nearly acquired Maxwell Technologies, a San Diego–based energy storage products and research business, for $218 million, with the transaction expected to complete in Q2 2019. Is this a stationary storage play or an EV play for Tesla … or both? Maxwell is Best Known for its Ultracapacitors — What are They? Ultracapacitors store electrical energy, like batteries, but rather than electro-chemically (batteries), they store the energy electro-statically. There’s also a notable difference in balance between energy density and power density. Lithium-ion batteries have energy density typically in the 150–250 Wh/kg range, and power density in the 250–350 W/kg range. Maxwell’s current commercial ultracapacitors, such as the DuraBlue rangepictured above, have much lower energy density of 8–10 Wh/kg (around 5% that of lithium-ion), yet much higher power density of 12–14 kW/kg (around 45× that of lithium-ion). In the context of EV applications, this means that a 50 kg array of ultracapacitors could potentially input or output 650 kW of burst power (although, at 0.18 kWh, this would last just a second or so). Lower power levels would obviously be sustained for proportionately longer. For context, that’s about twice the power that the Tesla Model 3 Performance’s 480 kg battery pack is currently tuned to provide (331 kW). If the economics made sense, a modest ultracapacitor array could work alongside the battery pack as a cache of energy, to reduce the load on (and/or work in parallel with) the main battery during short bursts of hard acceleration or strong regenerative braking. Since ultracapacitors can perform reliably over hundreds of thousands of cycles, this could also reduce the cycling load on the lithium-ion pack, and potentially allow it to have a chemistry that prioritizes energy density over power density. The round-trip energy efficiency of Maxwell’s ultracapacitors is in the 80% efficiency range, which is pretty decent (lithium-ion is 80 to 90%). In a mid-2018 conversation with the San Diego Business Journal, Maxwell reported having already sold 6.1 million ultracapacitors to automakers. With their extremely fast response, high power density, and high cycle durability, ultracapacitors also have applications in fast-response stationary storage applications and grid load balancing (read more about Maxwell’s case studies of these). You can see Maxwell’s other claims for the technology in the above presentation slide, from the Needham investor conference in mid January this year. 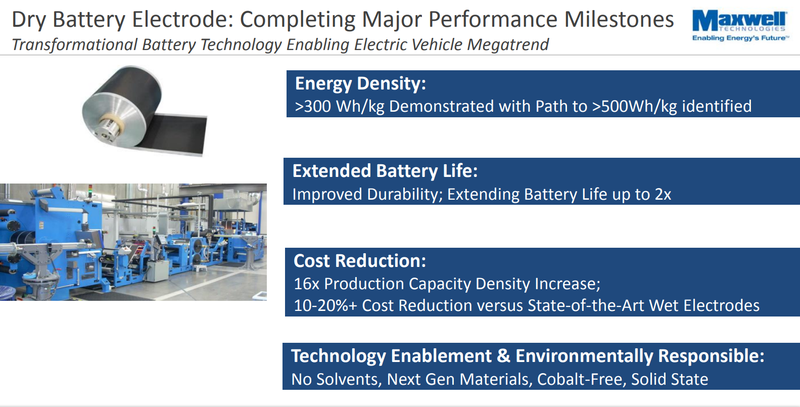 Maxwell’s 2017 annual report claims that, “The dry electrode can be further applied to advanced battery chemistries, offering well over 300 Wh/kg at the cell level.” It’s not clear whether these energy densities are enabled by their technology, or are simply compatible with the technology — the above slide appears to suggest the technology has a direct bearing on energy density. 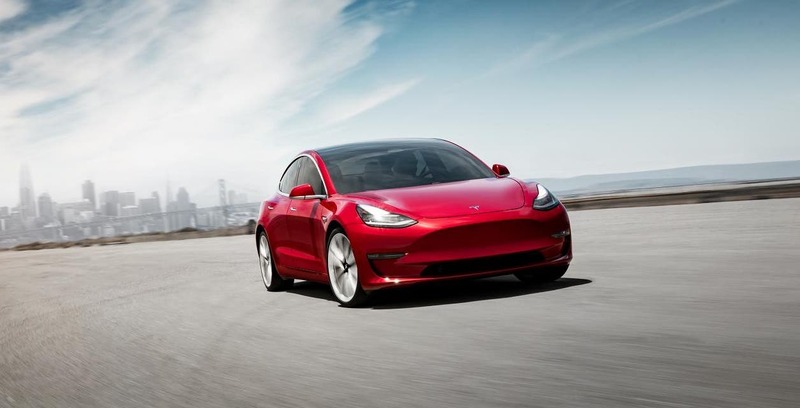 The claims of 2× durability improvement and 10–20% cost reduction will also no doubt have interested Tesla. The ultracapacitor technologies and/or the dry battery electrode technologies could have been the attraction for Tesla. Given Tesla’s deep investment in lithium-ion battery production, for both EVs and stationary storage, the potential cost savings and performance benefits from the dry battery electrode process is clearly interesting. The ultracapacitors also have potential for both stationary and mobile applications. The response speed, power density, and robustness would certainly make sense in heavy-duty grid applications, likely as a fast and powerful energy cache used alongside lithium-ion storage. Although it’s not so clear that there’s a significant need or benefit for ultracapacitors in Tesla’s passenger EV applications (beyond potentially enabling a different balance of lithium-ion cell characteristics, as mentioned above), the Tesla Semi’s heavy-duty use case may make more sense for employing an ultracapacitor cache. There even may be a case for using them in the Roadster for burst power. It will be very interesting to see how Tesla leverages Maxwell Technologies. Readers will no doubt have many ideas about how Tesla will benefit from this acquisition. Please do jump in and share them in the comments.